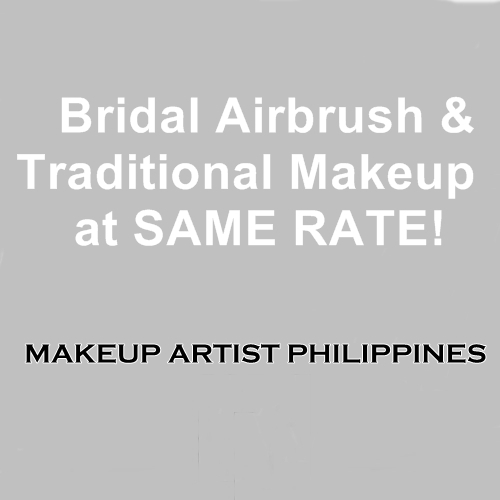 WE OFFER AIRBRUSH AND TRADITIONAL MAKEUP AT SAME RATE! This entry was posted in About Us, Bridal Hair & Makeup, Prenup and tagged Affordable Makeup Artist in Manila, Affordable Makeup Artist in Philippines, Airbrush, Airbrush Makeup Artist in Manila, Bridal Hair & Makeup, Makeup Artist, Makeup Artist Philippines, Mikee Palmera, Philippine Wedding, Professional Makeup Artist in Philippines, Top Ten Makeup Artist, Wedding Makeup Artist, Wedding Makeup in Manila. Bookmark the permalink.